Mweiga, Kenya, December 2015. Length is about 7 mm. 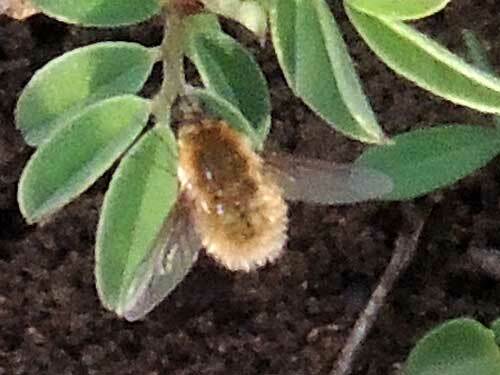 The immature stage of Bee Flies are worm-like parasites of ground nesting bees, beetles, cockroaches or other fly species. The adults of can hover in place like a helicopter and are frequently seen settling near the soil, often in a sunny spot. They also visit flowers where they feed on nectar Their resemblence to bees can frighted sting-wary people and perhaps confuse birds that might otherwise prey upon them. They can, on close inspection, be readily distinguished by having one pair of wings whereas all bees have two pairs of wings.